This post was originally going to be about the game itself, however as to be expected during the launch week the server is a little overloaded and there is some rather horrendous lag. 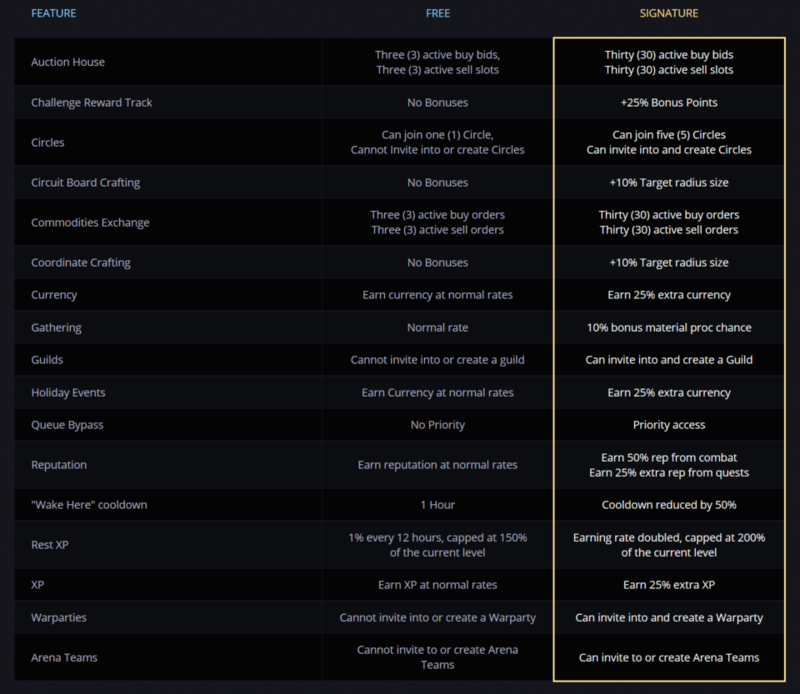 So, while I wait for that to settle down so I can jump in properly, I figured now would be a good time to look at the new features added to support the new free to play model, namely the in-game shop and the “Signature” subscription model. 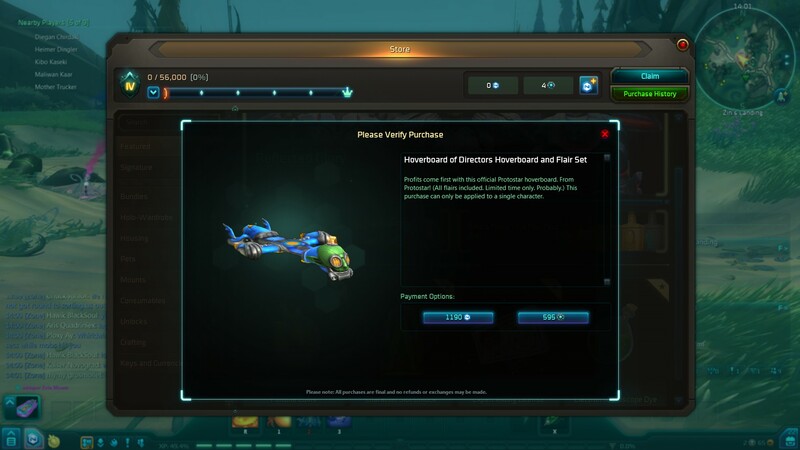 Now, being a free to play game, I have no issues with Wildstar offering these kind of transactions, as it’s a common sense approach if they want to keep the lights (and servers) on. The in-game shop supports purchases either using OmniBits, an in-game currency earned through just playing the game (they appear to drop from random mobs at low-level), or NCoin, NCSofts real money currency. It’s worth noting that while OmniBits are Wildstar only, NCoin are shared between other NCSoft titles, such as Aion or Lineage II. The cost for NCoin in the UK is currently 100 coins for £1, starting at a minimum purchase of 400NCoin (£4) and doubling each time up to 8000 NCoin (£80.00). So far through looking at the store the most expensive item (the Hoverboard of Directors and it’s Flair Set) is priced at 1190 NCoin, roughly £12, though you’d have to purchase 1600 NCoin at £16 if you didn’t already have some NCoin in your account. In terms of shop content, everything is either cosmetic, or a buff do earning credits/exp. There is no pay to win system, you can’t buy power of any sort. 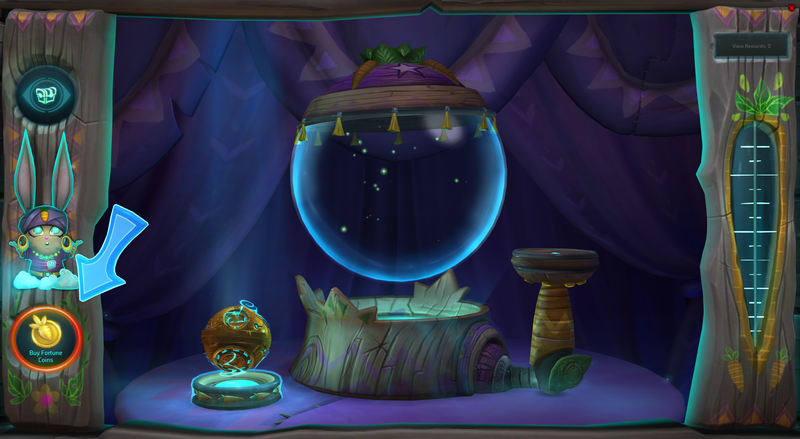 There are also a few mounts available for 790 NCoin (£8), a whole load of various decor and housing upgrades (between 80 and 390 NCoin), and the ability to buy more character (230 NCoin) and costume (150 NCoin) slots. Outside of the shop, there’s one other area of that game that encourages you to spend NCoins, and that would be Madam Fay’s Fortunes. Madam Fay’s is a place were you can spend fortune coins (brought for 80 NCoin on in the store) for a chance to win some rather interesting loot, sort of like a lucky dip. 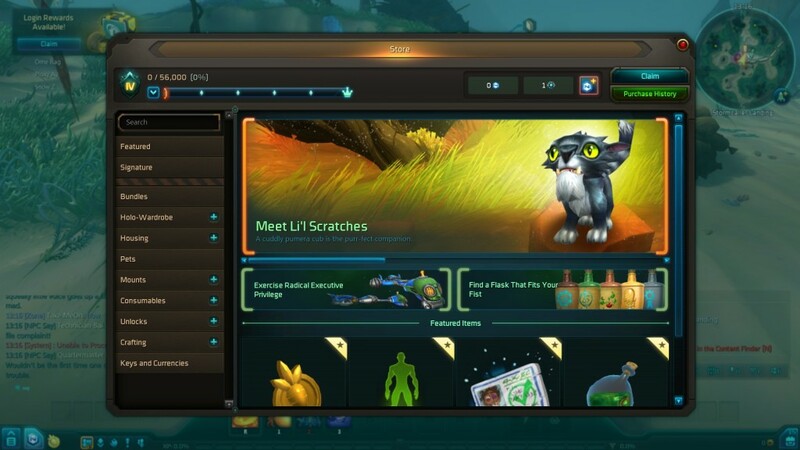 Again all of the items are cosmetic with there being a selection of various basic bits and pieces to help with trade skills, up to a selection of rather snazzy looking mounts. It reminds me a little bit of Hearthstone’s card pack opening, and knowing how addictive some people find that, I do wonder if that is the main intent of it. I have a feeling that if I drop some money in-game to get some NCoin, I’ll be giving this a try! In addition, there’s also the option of subscribing to a Signature pack, which grants you several passive bonuses including earning extra exp and getting priority access to the servers. These are priced at €8.99 a month (around £6.50 GBP). 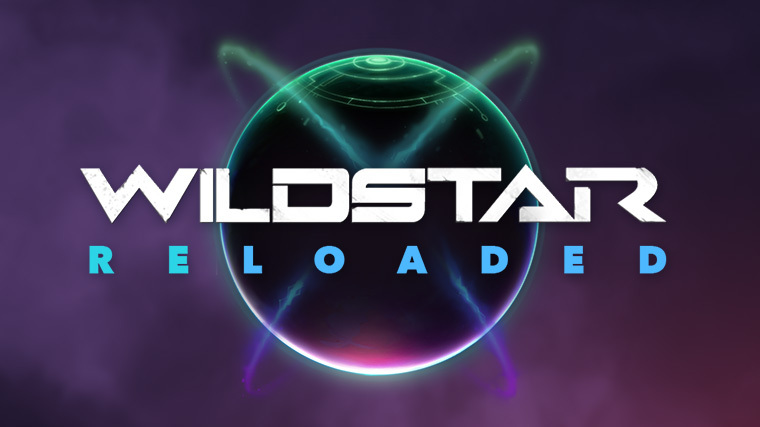 I’ve grabbed the full list of bonuses for Signature subscribers from the Wildstar site and posted them below for those who are interested. It’s worth noting that free players cannot create or invite others into a guild or war party, and are also unable to create arena teams, so they’d have to rely on someone with a Signature account to do so and invite them in to it, though it is possible some or all of these bonuses could be made available on the store at a later date*. It’s also worth mentioning that the 25% extra currency does apply to Omnibits, so a signature subscription essentially gives you a bit of a stipend for your in-game purchases at the store, though only if you are actively playing to earn the drops in the first place. Theres not really much more to say on the model at this point in time. I personally think the prices are in a good place, and the option to subscribe and earn some bonuses is always welcome. Wether I end up dropping some cash on the Signature subscription is yet to be seen, but once the lag is sorted I’ll definitely be grabbing some NCoins to give the rest of the store a try. 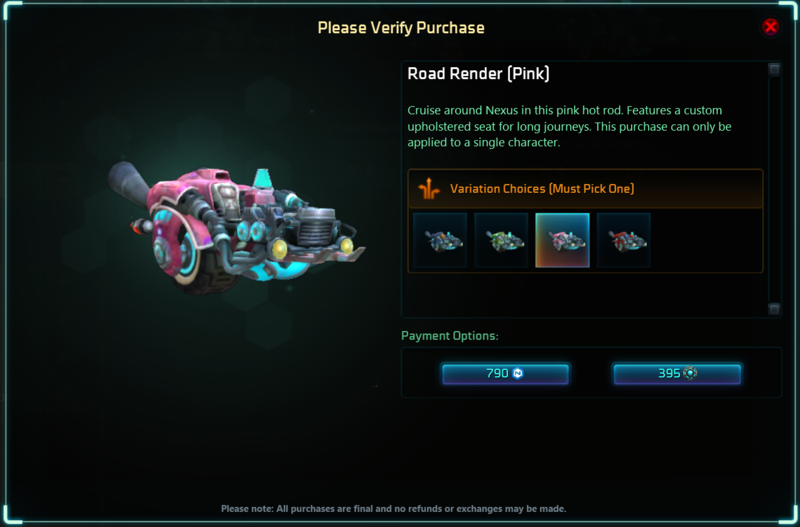 After all, there’s a pink hotrod-slash-motorcycle mount that has my name on it! *AMENDMENT: At the time of writing this article I was not aware of the Cosmic Points system in the shop, that rewards you based on how much you spend, similar to a loyalty card system. By spending money in game, or purchasing a subscription, you earn Cosmic Points, which in turn unlock both items and other perks for you. Full Guild, Circle and Warparty access can be earned by reaching the 2000 Cosmic Points marker. Part 2 – Looking at the experience from levels 1-10. This entry was posted on Thursday, October 1st, 2015 at 8:00 am by Jason and is filed under Blog. You can follow any responses to this entry through the RSS 2.0 feed. You can leave a response, or trackback from your own site.